Gadget: It's here because 'Honey I Shrunk The Sphinx' got its budget cut. Gadget: "Why are you just sitting there? Can't you see something wicked this way comes? Gadget: Women, only cook out of anger! *whispering* Beat it Zipper, I'm giving a speech to my femenist orginaztion, no males! 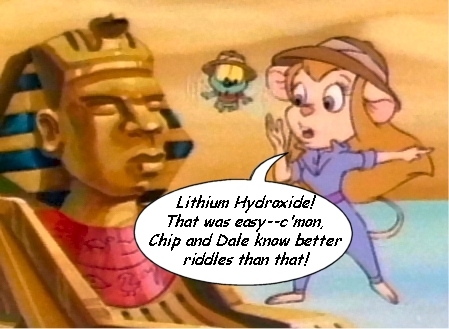 Gadget- Ok Mr. Eisner we did the "Ranger Round the World" bit for the next low budget movie sequel that'll have little or nothing to do with the original classics, so NOW can we have our show back? Gadget: I fixed the sphinx's nose and the insurance check should clear within a week, you guys don't have to wear the dresses tonight. Jeez the things we do for money since the show was cancelled. Gadget: I said: Are you auditioning for the musical verison of "Raiders of the Lost Ark" too? GADGET: Golly, Zipper, I think our "mummification of Michael Eisner" plan worked. Quick, fly to the animation studios and replace all the "Jungle Book 2" scripts with "copies of "Somemouse to Watch Over Me!" Gadget: C'mon guys, it's not that much farther this time,I know I said that twenty miles ago but I mean it this time I swear it! Gadget: Just down the hall, second door on the left. GADGET: Golly, Nimnul's Giganto-Ray still works! Now to terrorize the countryside, BWA-HA-HA-HA-HAAAA!!!! Gadget: We just need to move it a few more feet, so push guys! Gadget: (in a deep voice) "Gadget's over there!" ::whispering to zipper:: "Chip and Dale sure are hard to loose durring mating season, but they are easy to fool." Gadget: Quick guys this way. Indy's coming and I thing he wants another caption with me in it!